Our range of VCB Spare Parts is developed using premium quality material. These are widely recommended by our clients for their accuracy, stability and superior performance. Fabricated by vendors using high quality raw material that ensure their durability and reliability. We are manufacturing /Trading the Road Construction all equipment's Control panel and original electornics spares. The below mentioned all panel are ready available with us. Spares and service support for ABB switchgears. 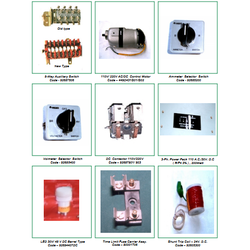 We are offering a wide range of VCB & OCB Spare parts. We avail wide range of spare parts to all our clients as per their needs and requirements. We used to fix the parts of various machine tools as per the need. These spare parts are of high quality and cater to the various needs of our clients too. We Offer various Vacuum Interrupter Used In Stlmec ltd Circuit Breaker.